I seem to be a sucker for flying moments set to lovely music. I had tears streaming down my face in the flying portion of How to Train Your Dragon. I know, I’m a sap. Anyway, the latest clip from Legend of the Guardians: The Owls of Ga’Hoole has that same sort of flying + music moment. So what do you think? Will it do the very popular series proud? I think it just might! Thanks to Cinematical for the link. The author of One Hen: How One Small Loan Made a Big Difference continues to explore the impact of education and funding on poor communities. Here, she has written a book about a farming family in Honduras who learn techniques that allow them to grow enough food to feed themselves and earn enough money to secure a positive future for the family. Maria Luz and her family have run out of food so her father must head out of town to find enough work to pay for the seed to plant next year because they will have to consume what they would have saved. He leaves Maria Luz in charge of the garden while he is gone. At school, she learns about compost, terrace gardening, and other ways to keep the soil fertile. When her father returns, he is surprised by her success. He and Maria Luz work with her teacher to avoid selling their produce to the local coyote and instead sell it themselves at a market and purchase seeds themselves. Through one man’s efforts to educate, an entire village is transformed. The author here has taken her subject very seriously, as is appropriate. The text is lengthy for a picture book, but helps explain the impact of food insecurity around the world. 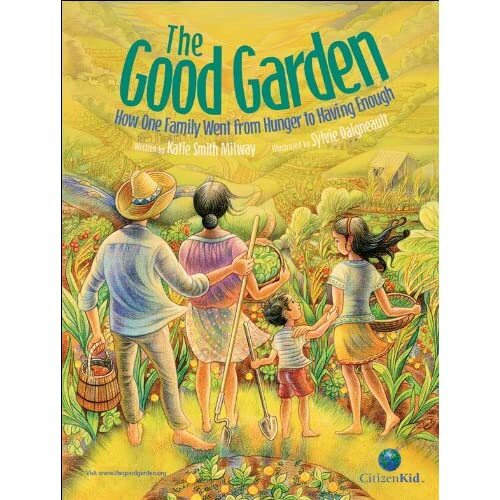 While this is not a picture book to add to a story time, it will be of value for elementary children who are learning about the world, gardening and food. It is a book that teaches and informs. Smith Milway’s text does not shy away from the control of the coyote, the fear of starvation, or the loss of families who leave to live elsewhere. Her words convey it all with a seriousness and gentleness that is lovely to read. Daigneault’s illustrations seem to glow with an inner sun. Her use of colors is dynamic at times and subtle at others. In all of her pictures, there are flowing lines that help depict the beauty of the Honduran landscape. The illustrations help bring the text to life, making the book even more appealing. An important book for children to better understand the world they live in, this book is informative and radiant. Appropriate for ages 6-9. You can visit The Good Garden website at: http://www.thegoodgarden.org/ where you can learn, play or help make a difference. I thought I’d had my fill of paranormal books for teens. The last few I had tried were duds, given up only part way through. 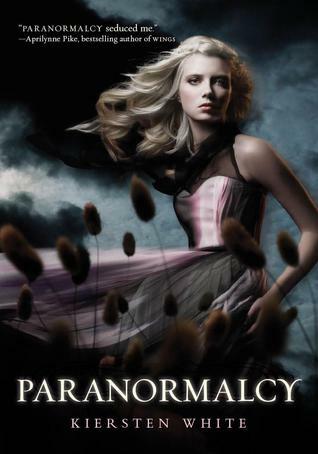 Then I started hearing a buzz about Paranormalcy and I took one look at that divine cover and just had to read it. Am I ever glad I did! Evie has worked for the IPCA (International Paranormal Containment Agency) since she was eight. She has a unique talent that no one has ever seen before, she can see through the glamours that paranormals put up to hide themselves from view. When she looks at a gorgeous vampire, she sees the dead person beneath. When she looks at a werewolf in human form, she sees the wolf eyes. So she works as a paranormal hunter, tracking down rogue paranormals and containing them. But now something is killing the paranormals and Evie has begun to have strange dreams that seem connected. Plus her ex-boyfriend, a faerie named Reth, is trying to kidnap her and no one is taking him seriously. Evie’s dull life of monster hunting is about to change, and it just may be all her fault! White writes with a wonderful bite of sarcasm, a gift for description, and an ability to show emotion without telling it. She has managed to take an over-extended genre and make it feel new and fresh. A large part of that is the unique perspective of Evie herself, a character who is awed by the normal from being surrounded by the paranormal. She is an innocent in our world, taking her own amazing world for granted. She’s a great character to view the paranormal through. Evie is a very strong female character. She’s a monster hunter, a rule breaker, and someone who can use her brains to get out of a lot of scrapes. She’s one tough girl. There is plenty of romance in the story too. The romance scenes in the book are sensual and tender without going too far. White has created an amazing boyfriend for Evie combined with a very interesting ex-boyfriend. Add this sizzling romance to the adventure and action and you have a book that is impossible to put down. The cover of this book will sell it right off of your shelves, but if Twilight fans are looking for the next great fantasy read, get this in their hands. Thanks to the strong female lead, I’d also hand it to Hunger Games readers. Appropriate for ages 13-15. Reviewed all over the book blogs.